Antiques Roadshow will celebrate its 40th birthday with a special episode set in Albert Square, of Eastenders fame. Antiques Roadshow usually films in and around prestigious old manor houses, and nearby guests bring along items to be valued and potentially sold. However, to celebrate four decades on air, Fiona Bruce and her team of antiques experts will be doing something a little different – filming outside one of the most recognisable locations on British television. There is a reason for the madness, however. The special will focus around antiques from the world of film, television and music. Guests will be encouraged to bring all kinds of mementoes from the world of entertainment, including old film props and treasured unique celebrity items. Speaking to The Telegraph, producer Simon Shaw said: “We tune in quite closely to what our viewers enjoy and watch their feedback, and we know there is a desire for, occasionally, special programmes which focus on one topic. “I think they’re very revealing these kinds of stories. They give people an intimate snapshot of often unpublished tales about how well-known productions have come about. The episode will be filmed in 2017 and has been a long time in the making. 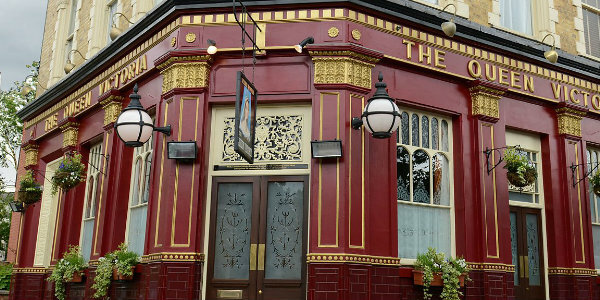 Shaw also revealed that the team spent 18 months in talks to film at the iconic soap location, during which time they had to find a way to fit around the Eastenders filming scedule. Shaw said Albert Square was the “perfect setting to do an entertainment special”. The 40th anniversary special of Antiques Roadshow will air in 2017.